Description: EB KCS freight eases thru Monroe at 10 mph. Title: KCS 6603 at the lead of a train in NS's E. Norris Yard in Irondale, AL. Description: KCS eastbound manifest heads out of Monroe with a leased MRL SD45 trailing. Description: Me thinks this was at one time part of CN's livery? Description: Lead unit on meeting train on Rich Mountain and I got lucky to have an empty log gon pass to get these shots. 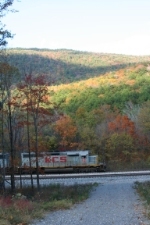 Description: Fall Colors and KCS on Rich Mountain, what could be better! Description: This power had just cut off a train and was about to back up to the Service Tracks. Description: NS 220 trundling thru Mableton back when it ran with all KCS loco.s. Date Unk.